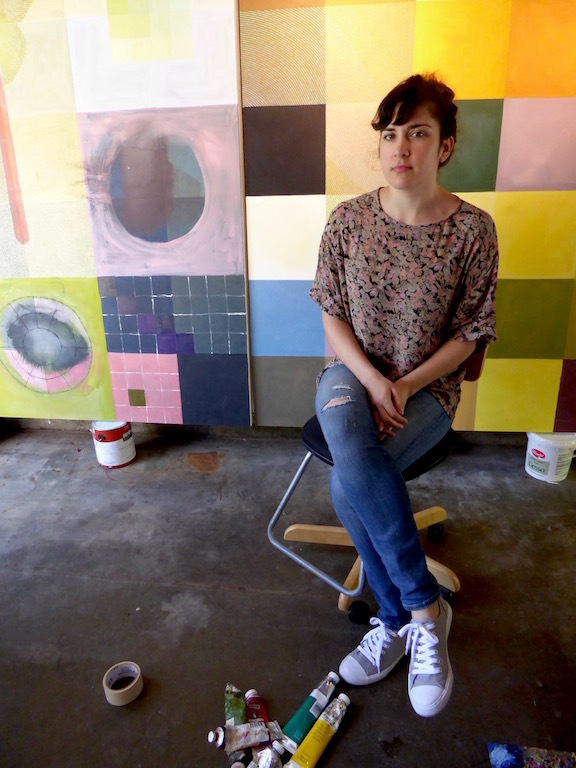 Kerry Cottle is a Sacramento-based artist who creates hypnotic, abstract paintings composed of fields of color, repetitive marks, and iconic shapes such as triangles, teardrops, and semi-circles. Reminiscent of classical mosaics and folk textiles, each painting consists of harmonious colors, shapes, and movements. TUBE. Magazine: What would you like to talk about first? 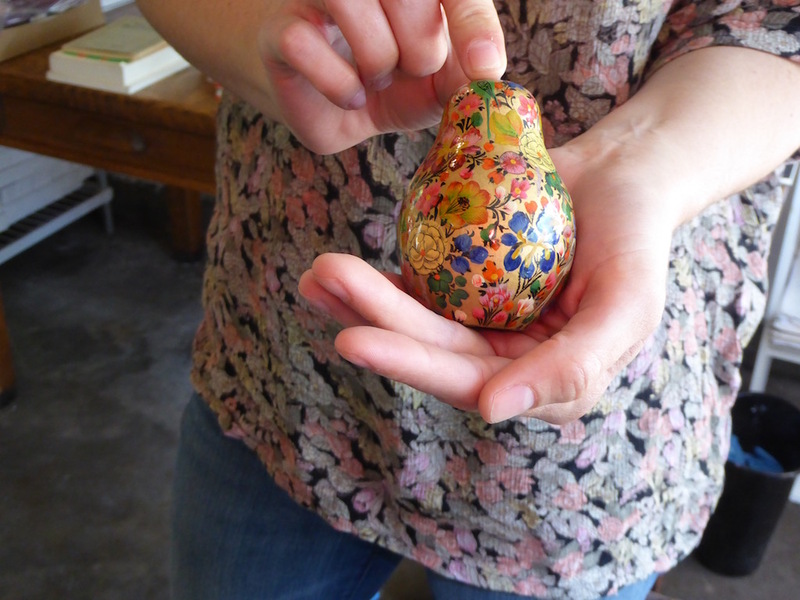 Kerry Cottle: I’ll talk about this painted pear I received from my grandmother. She collected pears. TUBE: What’s it made of? K: It’s made of wood and it was hand painted in India. T: Did she give it to you as a gift? K: She let me take whatever I wanted. So I chose this one just because I think the craftsmanship is really nice. T: It’s really beautiful. Can you talk about her collection? K: Well, my mom’s side of the family worked for Del Monte and we also had our own pear orchards. So my grandma, for whatever reason, just surrounds herself with little pear artifacts. T: Can you tell me more about your family’s involvement in the pear industry? K: So my grandma and grandpa, my mom’s mom and dad, both worked for Del Monte. They were big into farming, agriculture, canning, and all of that stuff. So that’s how they made their living. But also my great grandma, my maternal grandmother’s mother, had a big pear orchard on her property and so that’s how my entire mom’s side of the family was able to support themselves. My grandpa is retired and lives up in Yuba City. His backyard is like a mini orchard. It’s like a little oasis and it’s beautiful and amazing. J: Does your family’s history with farming and agriculture influence your artwork or practice in any way? K: Not directly. But what I do appreciate about painting in particular, or at least, the way I paint is that it’s a really slow process. I think it really slows you down, which is related to growing your own food, the slow lifestyle, and sustainability. J: Do you remember your grandmother’s pear collection from your childhood? K: Yes, oh my gosh. It’s actually funny. I noticed this the other day. My grandma collects pear things and she’s had them forever. And my mom collects watermelon things. When I was a kid they would always try to push cherry stuff on me. My family has a weird fruit obsession. J: Does [the pear] live in your studio? K: Yeah, I keep it with my books. J: Do you want to talk about your paint palettes next? K: Sure. I don’t even know how many years I’ve had these. But I never clean them. So it’s just paint on paint on paint on paint. I think it’s kind of cool because over time all the paint is still there. Cottle’s paint palettes with built up oil paint. T: So do you still use these palettes when you paint now? K: Oh, definitely. I just mix new paint on the dry patches. So whenever something dries, I go over that spot and remix. T: Is there any specific reason why you prefer using the old pallet rather than having a clean pallet every time? K: I think it mostly has to do with laziness. It just works. So it doesn’t seem like I need to clean it. 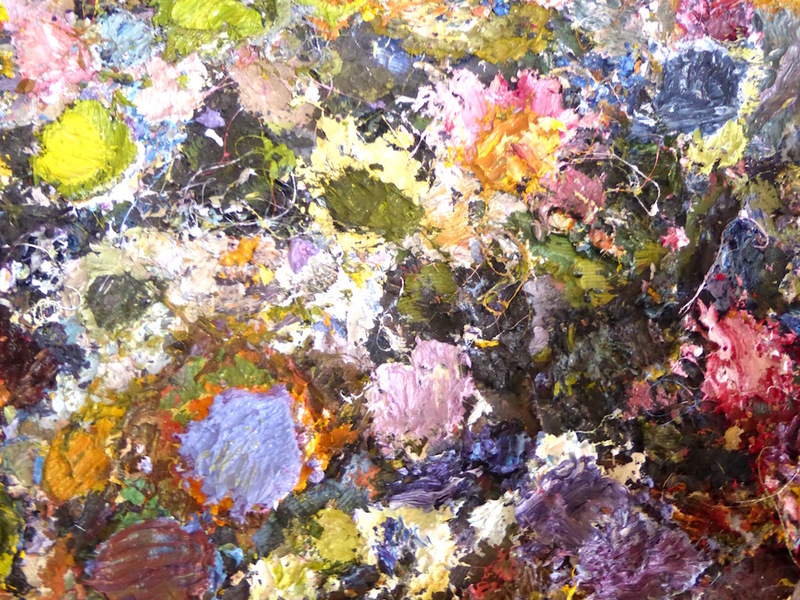 Detail of one of Cottle’s paint palettes. 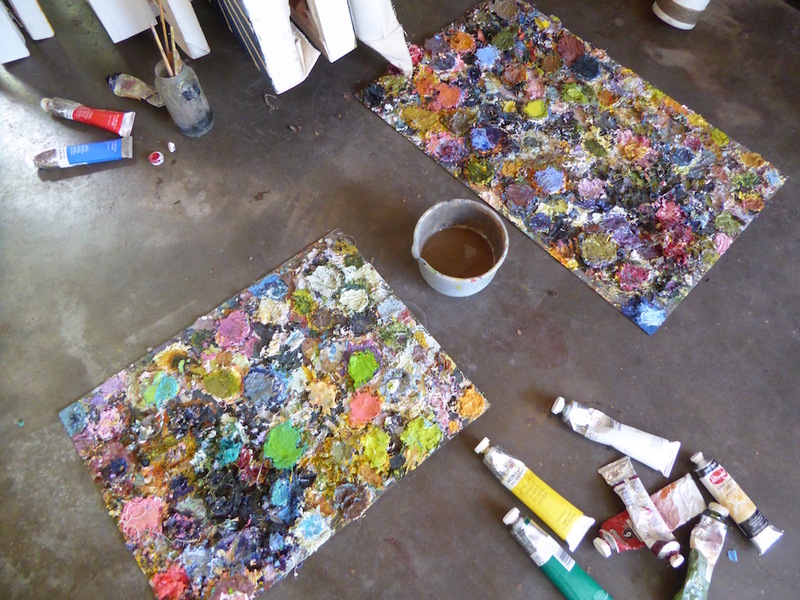 T: Has there ever been a time when you’ve felt the need to have clean palettes, before every painting? K: When I was in school, I remember, the professors always try to instill in you the proper practices. But, it’s just stupid. So I think then I tried a little bit more because I thought that’s what you were supposed to do. But now I don’t care anymore. J: I’ve never seen a palette this built up with paint. It does look pretty cool though. Are there any specific types of paints you like to use or colors you prefer? K: I use oil paint. I basically just buy whatever I can afford, which is generally the lower end stuff. I love red, and pink and yellows. Multiple shades of pinks, yellows and, oranges. I like the warmer side of the color spectrum. K: But I also like dirtier colors. T: Nice, it’s good to have a balance. So do you want to talk about the objects in this bin here? K: These were my great aunt’s materials. She was an oil painter too. She did a lot of floral stuff. And when she passed away, my dad’s side of the family gave me all of her stuff. And I’ve used a lot of it. So some of it’s not even in here. There’s some leftover white oil paint that she got in Italy. She was from Italy. And let’s see, what else? There’s some fixative, some glue, there’s some charcoal somewhere. I don’t even know what this is… here’s a dentures container. There are little tools to put wire on the back of your canvases. She had a lot of oil paint left over that I’ve used. That is the thing that I actually use the most. I also have some of her floral oil paintings. 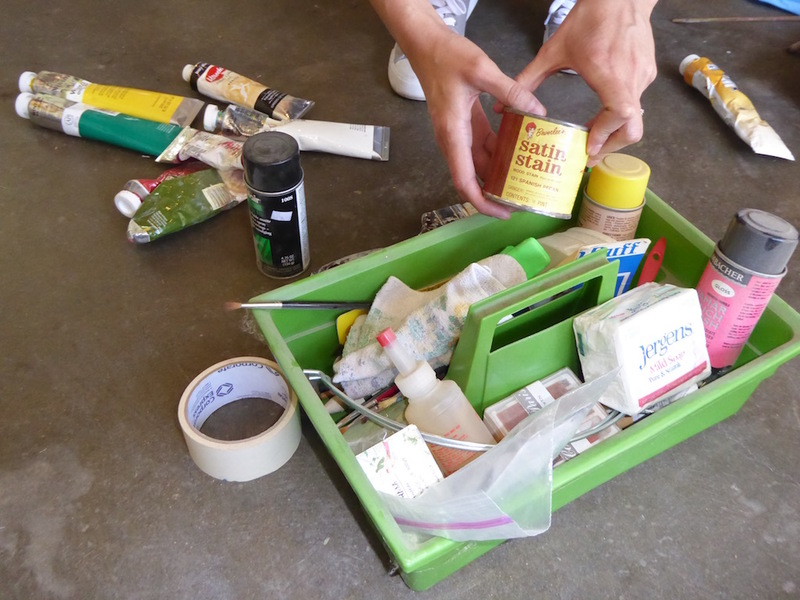 Bin of miscellaneous art materials, which belonged to Cottle’s great aunt. T: Can you talk about your relationship with your great aunt a little bit? Did you have a relationship with her? K: Yeah. She passed away a long time ago. She and my dad’s mom were twins. They were really cute. And they were Italian, so they were pretty sassy. My grandma was the sassier of the two. And my great aunt was a little softer. I don’t really know how she got into painting. But she did it all the time. And she made all these floral paintings that were really nice. I think was just a hobby. Or that’s what she probably considered it. Tags: Art, Artist, Del Monte, Justina Martino, Kerry Cottle, painting, pear, Sacramento, Studio Artifacts, studio visit, TUBE. Magazine, Yuba City. Bookmark the permalink.